Even the short wheel base Tracker can’t navigate this obstacle course! This raven, or his family members, seemed to follow me around all day. 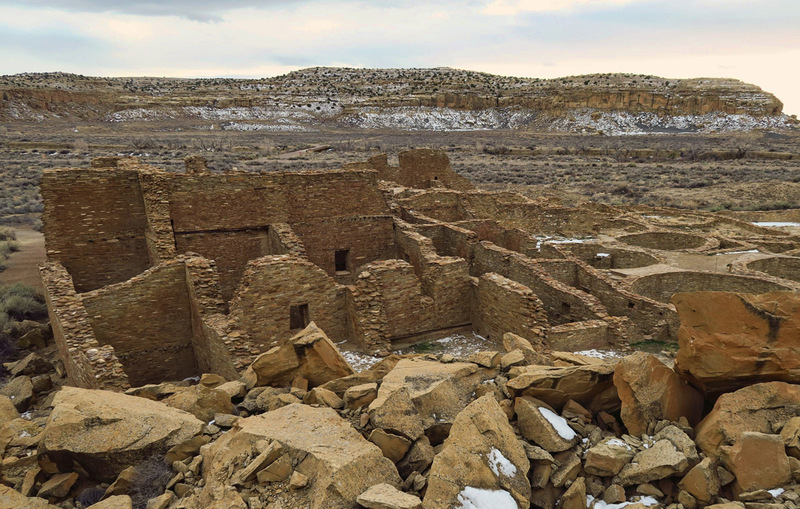 Since the Winnie was already winterized in prep for my stay in single-digit temps on the south rim, I picked out a few “wintery” spots to visit along my route home for the holidays. 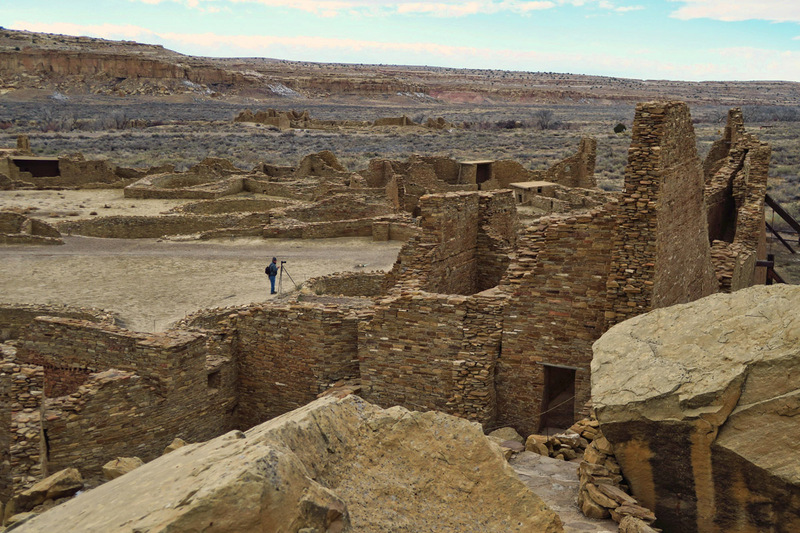 Having heard about Chaco Canyon while in Mesa Verde, followed shortly thereafter by Mark and Bobbie’s blog post that same year, I set my intentions to visit in spite of snow on the ground. (Take a look at Mark’s photos, as he had the benefit of blue sky and sunshine, rather than my flat light, gray day.) At over 6,000 ft elevation, an overnight in the nearby Farmington Walmart had been pretty brutal. To see the ancient site would mean another night of the same, as I wasn’t paying for full hookups with all my tanks empty…besides, my propane heater does a much better job than electric. Still, could my batteries hold out for two cloudy nights in a row of the furnace running all night? 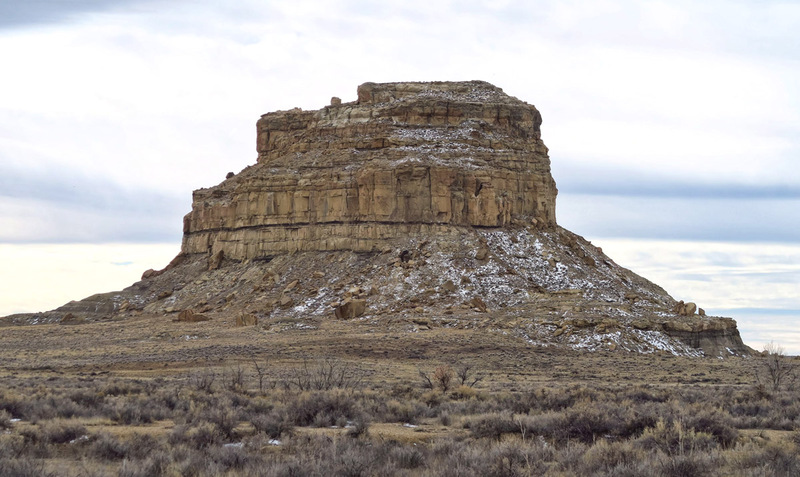 Fajada Butte has an ancient manmade ramp to the top, now closed due to erosion. 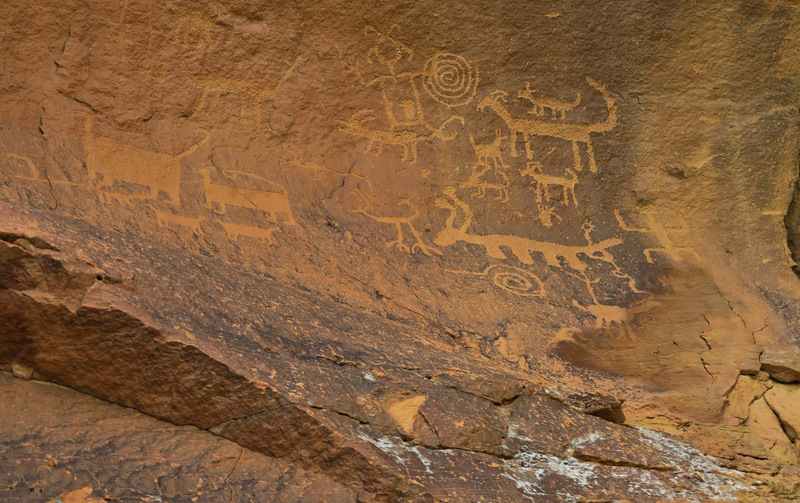 One of the many petroglyph panels, this one near Una Vida site. Everything I read about the site, from the NPS website to Trip Advisor write-ups warned about “that ROAD! That horrible, indescribable road!” It’s 21 miles to the site from the highway. The first five are paved, while the remaining 13 are dirt….but it’s the last five miles that will make you contemplate bruised kidneys, shattered teeth, and a broken tailbone. 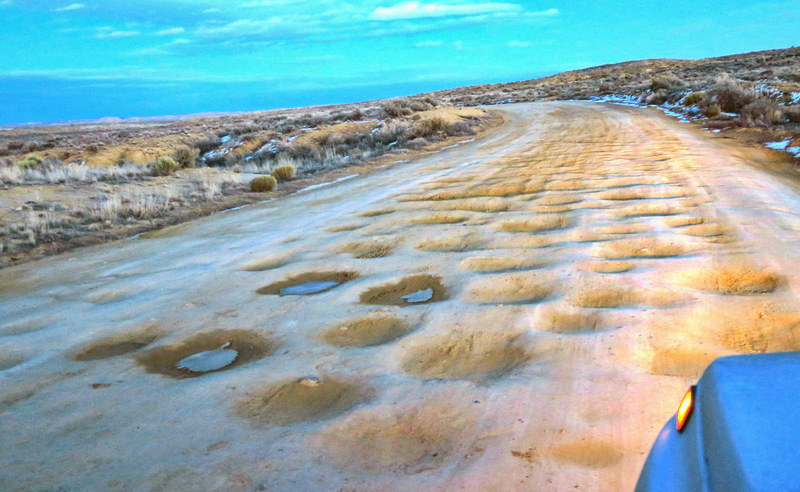 Washboards that rattle the fillings in your teeth, pot holes impossible to dodge. I feel sorry for anyone who might ride in on the passenger side, as one needs the steering wheel in both hands just to hold on! For the final stretch, I literally drove through the soft sand of the ditch at a 45 degree angle to avoid the obstacle course. Original timbers still in place from 1,200 year old construction. Structure remains in place even after the timbers have rotted. Although there is a campground onsite at the park, there is no way I was going to take the Winnie down that road! I felt guilty enough taking the Tracker! But to leave the Winnie behind in Farmington would mean driving the Tracker over 150 miles round trip…beyond his comfort zone for one day. So I called the park to ask if there was a place to leave the Winnie while I did the stretch of rough road. The park advised that Red Mesa Express, a small gas station near Nageezi at mile marker 112.5 along Highway 550, had been known to allow parking, advice which proved to be very useful. 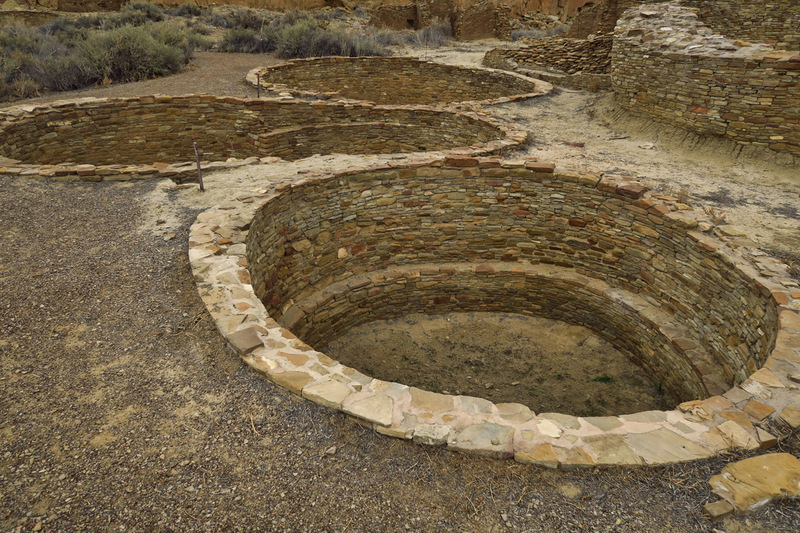 Ceremonial Kiva, would have been covered with wooden beams. During the half hour I spent wandering through the Visitor Center, a dozen or so visitors came in. Every single one of them made a comment about “the road.” One guy even went so far as to say “The National Park Service should be ashamed of themselves!” But it’s not the NPS. They don’t own the road. And clearly, as evidenced by the tempered answers from the Ranger, there are a lot of politics involved. The standard answer is that the roads leading in belong to multiple owners; county, tribal, and private owners, none who can come to agreement on plans, funding, or even desire to improve the road. 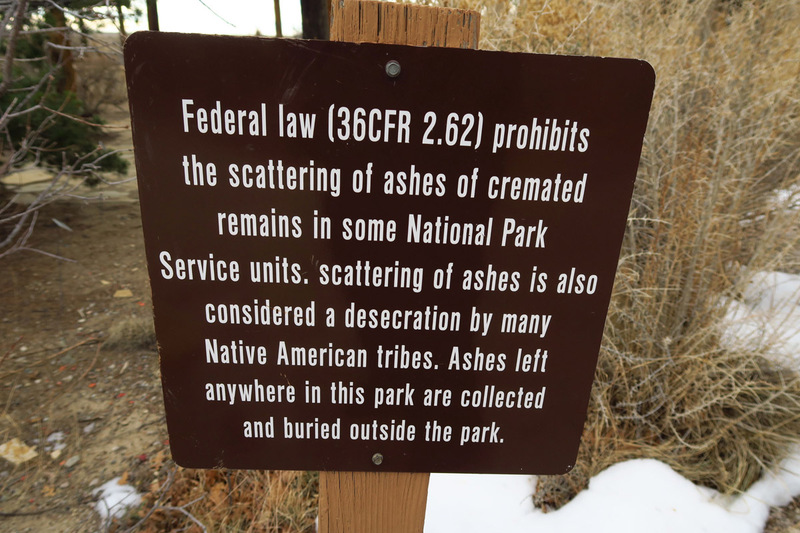 It does, after all, put a limit on visitation to a site still considered by many to be sacred. Photographer with tripod shows scale of Puebla Bonita structure. Overlooking Puebla Bonita on the Ranger tour…there is a higher vantage point if you are willing to climb. 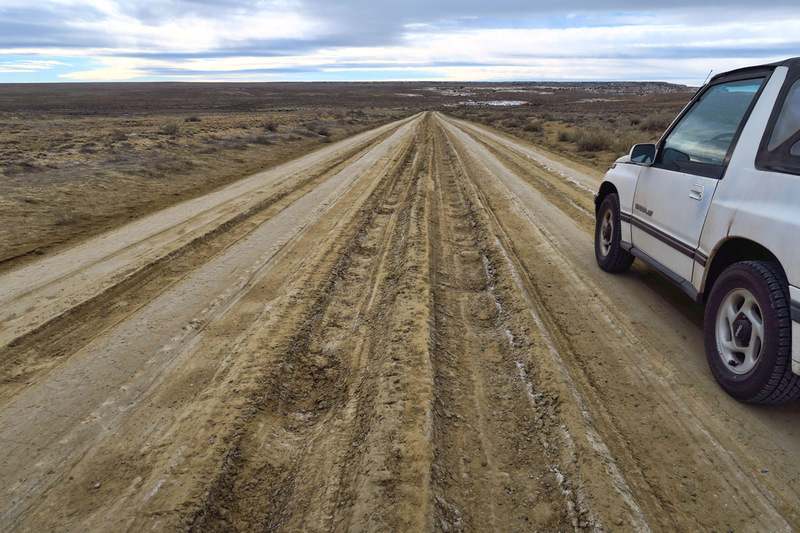 This abysmal road is only one of two remaining passable egress points from what has been identified as over 400 miles of carefully engineered roads leading to Chaco, some with even two and four lane segments. 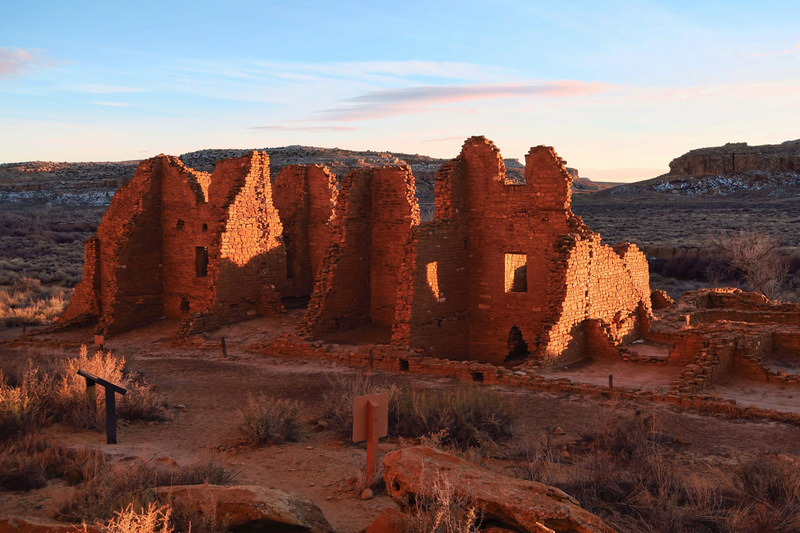 This cultural hub of the ancestral Puebloan people was believed to be the heart of a regional network which functioned as ceremonial, social, political, and trading center for more than 300 years. 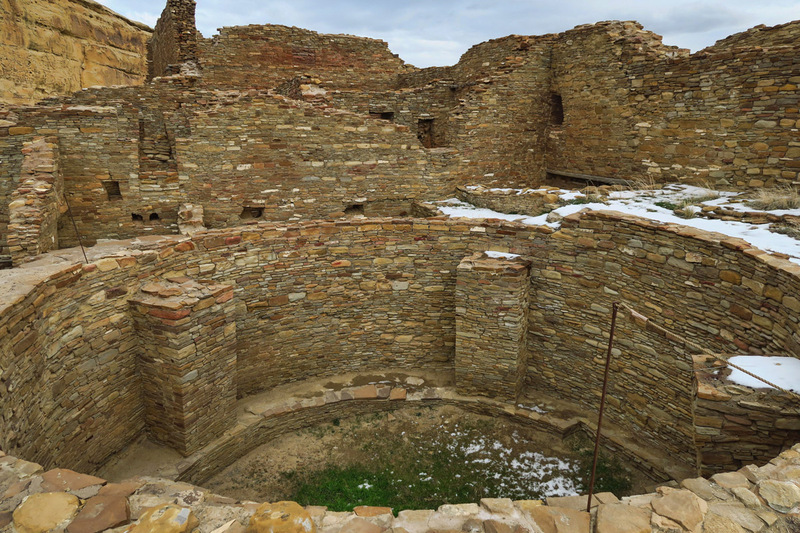 Hundreds of thousands of artifacts have been excavated, including seashells, copper bells, macaw feathers and bones, and over 200,000 pieces of turquoise. Over 100 cylindrical jars containing traces of cacao, or chocolate, were excavated and now are stored in the American Museum of Natural History in New York, indicating trading as far away as Central Mexico. Evidence that structures were up to four stories high. 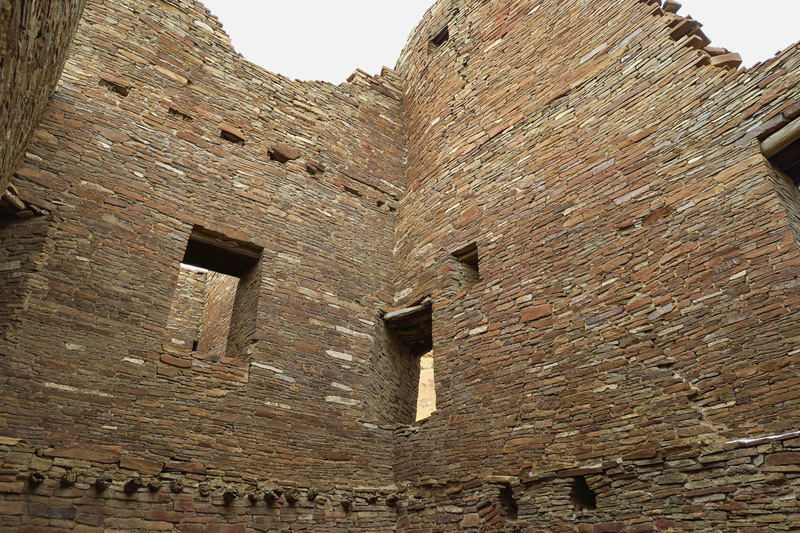 More unexplained structures inside Kiva. 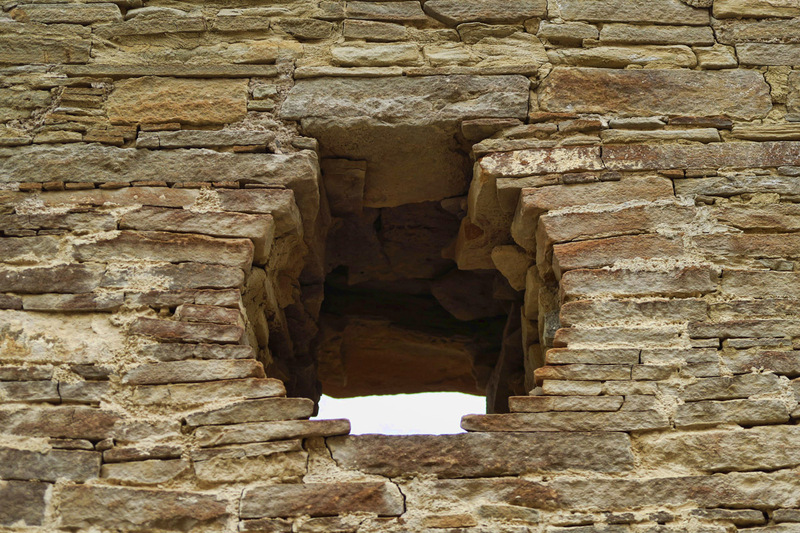 One of the fascinating, sophisticated “corner windows” believed to have been built to observe the solar and lunar cycles. 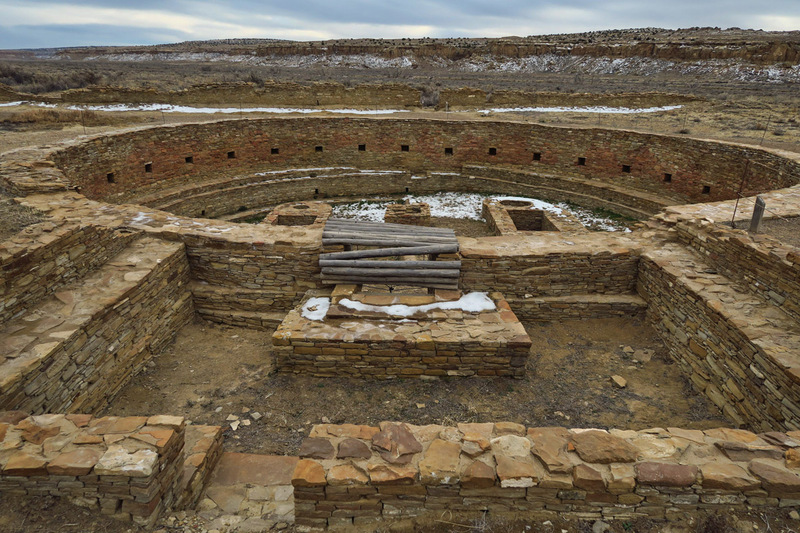 Although preservation initiatives have identified more than 2,400 archeological sites within the current park’s boundaries built between 850AD and 1150AD, only a small percentage of these have been excavated. 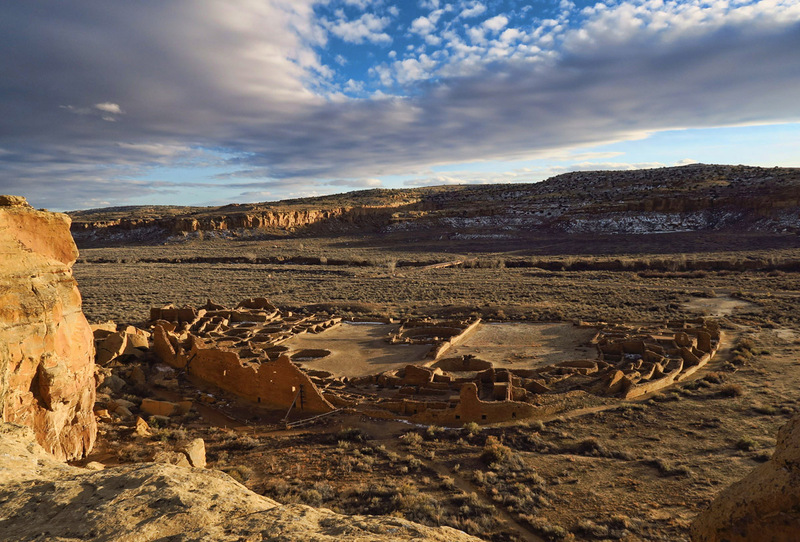 The nine mile park road along the bottom of Chaco Canyon provides access to the excavated sites. In spite of my early start, due to the short winter hours of daylight, I only made it to half a dozen before the park closed at sunset. Puebla Bonita is a maze of rooms. Another corner window, and exposed beams that separated the floors. In the center, a “metate” or grinding stone used to process grains and seeds. Logs, now 1,200 years old, were carried from 70 miles away on foot. By far, the most impressive of the sites is Puebla Bonita, a four-story complex once containing over 600 rooms and 40 kivas (round, underground ceremonial structures.) 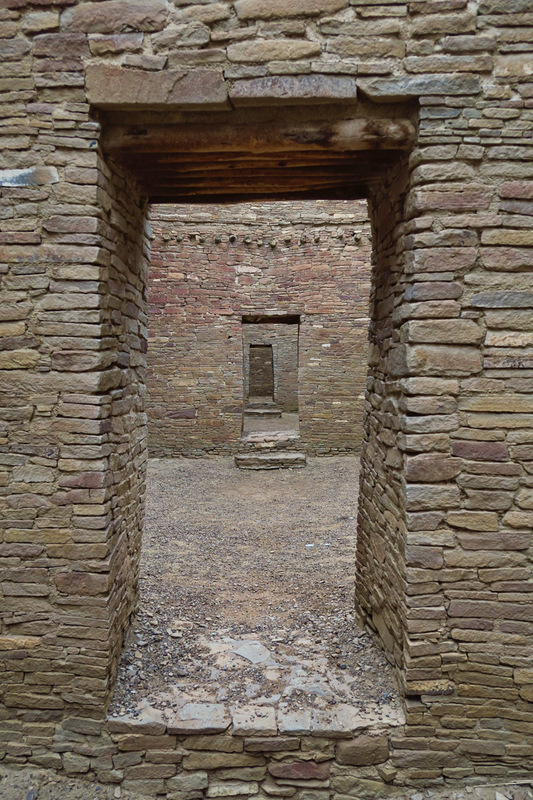 I highly recommend the Ranger tour of this site, as it is filled with bits of information that one might otherwise miss….like the fact that the beams required for the Chacoan structures, many still in place today, required the wood of 200,000 coniferous trees, mostly hauled on foot from mountain ranges up to 70 miles away. 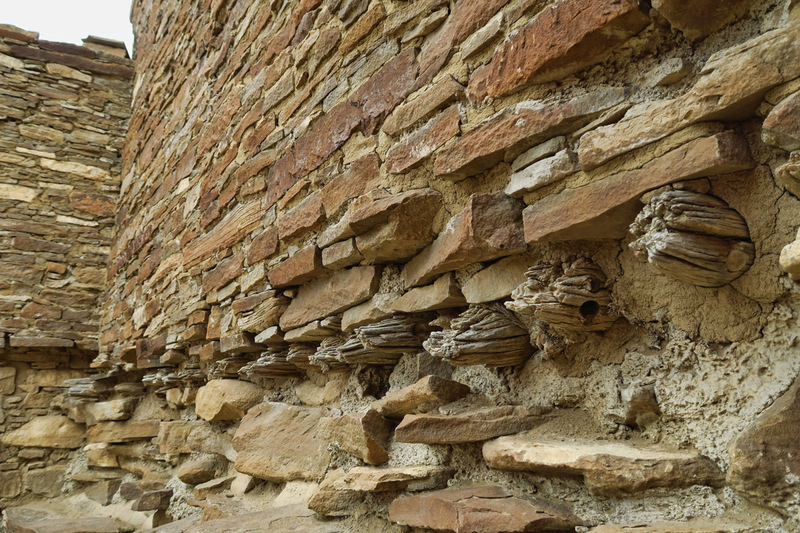 Or the massive masonry walls up to three feet thick, uniquely known as “core and veneer,” with the center of roughly shaped rock set in mud mortar, with outside layers of finer masonry veneer. 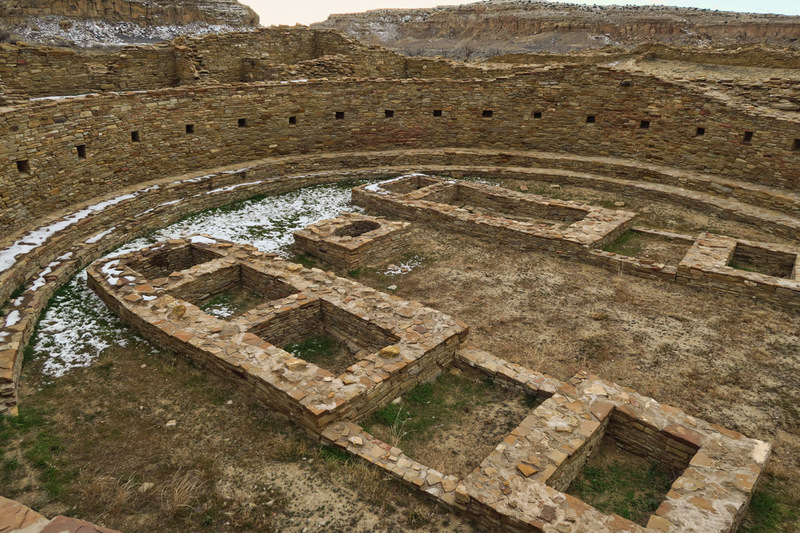 Or the most fascinating aspect of the Chacoan site in my opinion…cardinal alignment to solar and lunar cycles. The best example of this astrological significance and sophistication is evident in the many “corner windows” positioned for observation of the sun during the winter solstice. 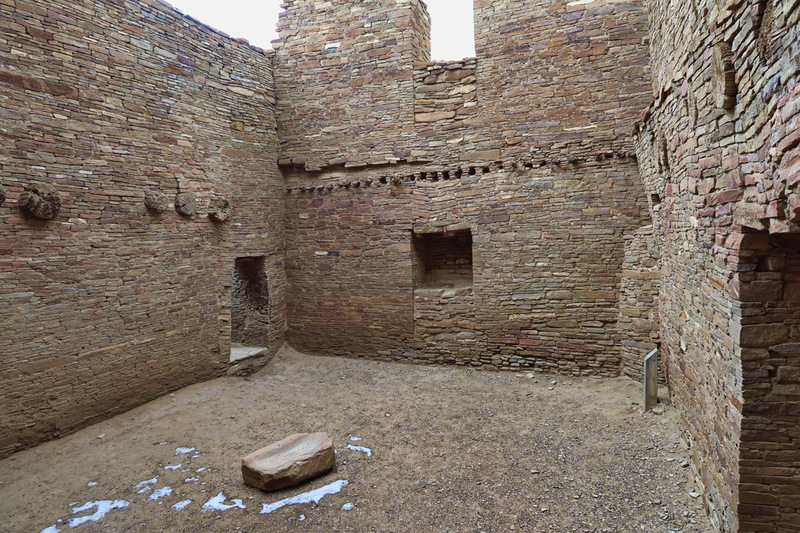 One of the larger ceremonial kivas. Some rooms were positioned at complex angles. 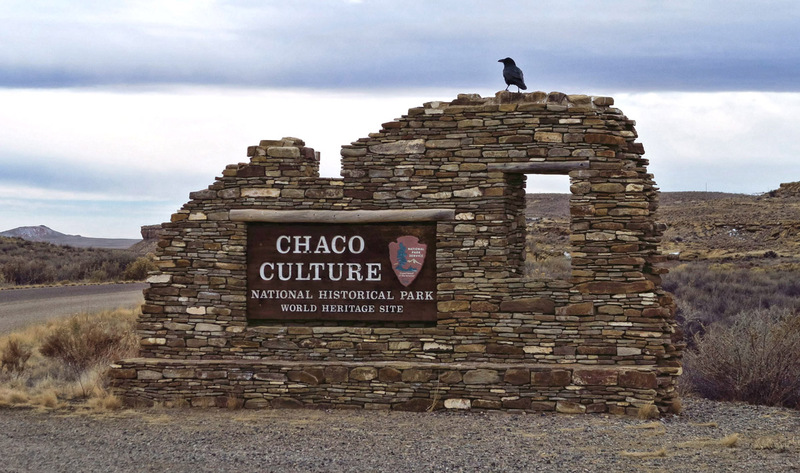 There are many opportunities for hiking and biking in Chaco, but the lack of a suitable road for RVs makes time management a challenge, particularly on short winter days. I did manage to climb to the overlook over Puebla Bonita, just as the sun peeked through the clouds after a flat gray hazy winter day. However, this left me racing to exit the park before sundown and get back to the paved road before dark. 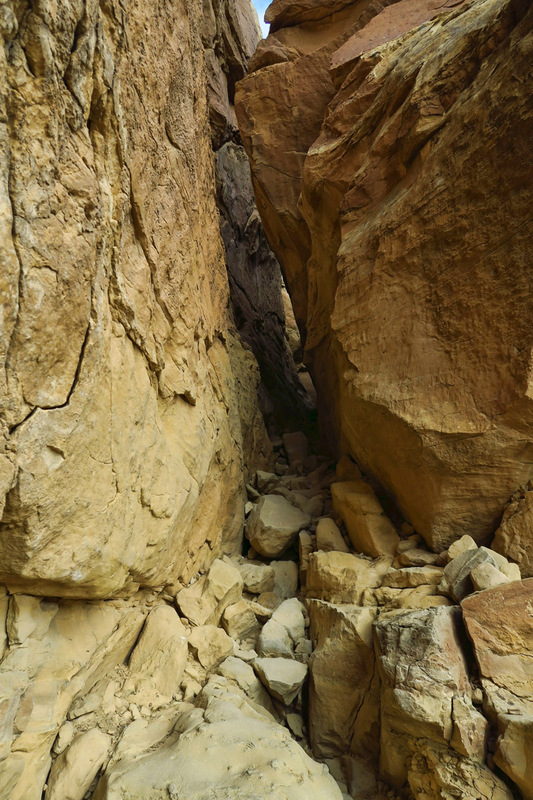 To reach the Puebla Bonita overlook, you must climb through this crack! View from Puebla Bonita overlook. Figures, the sun comes out in the last hour I have to explore the park! Fracking, shale drilling, oil, destroying our sacred lands….why can’t we learn from these ancient peoples whose entire world evolved around the sun, and see fit to tap into the greatest renewable resource of all time, solar power! 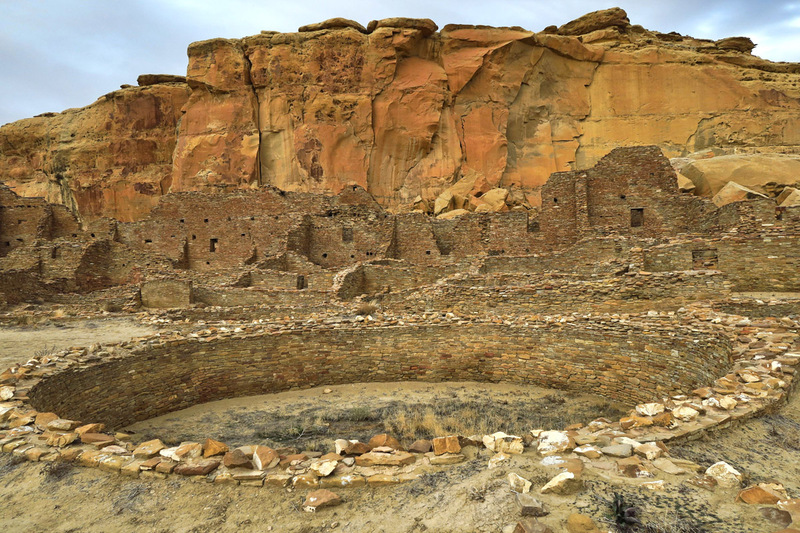 This entry was posted in New Mexico and tagged ancestral Puebloans, Chaco Culture National Historic Park, Puebla Bonita by Suzanne. Bookmark the permalink. So glad you made it to Chaco Suzanne! Good decision to spare Winnie the road trauma. But all who take on the challenge are more than fairly rewarded. Clear skies! The engineering and construction is amazing. So sad that the adjacent land has been leased for drilling. 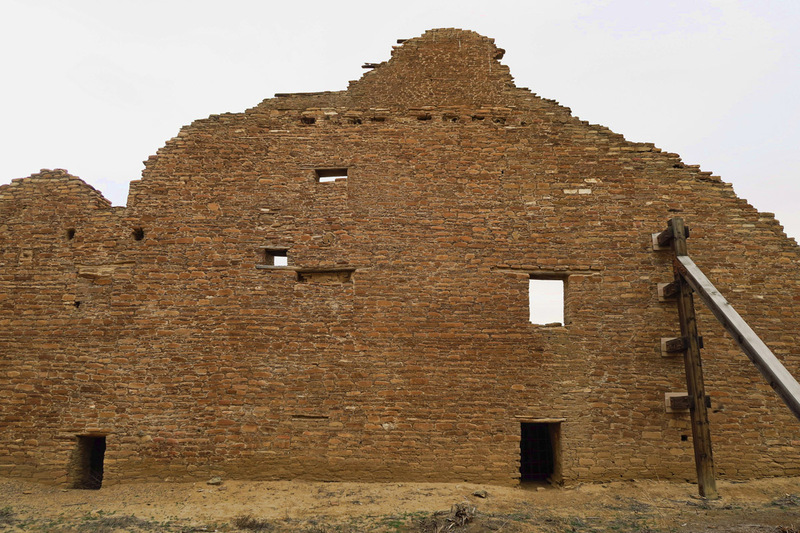 We passed on Chaco just because of the road, and it sounds like it won’t be improved any time soon. So do the park employees live on site? Terrific post as usual. You are one of the best out here. Thanks for taking the time. This place is on my list. Fantastic ruins and what brilliant masons they were to construct those dwellings. 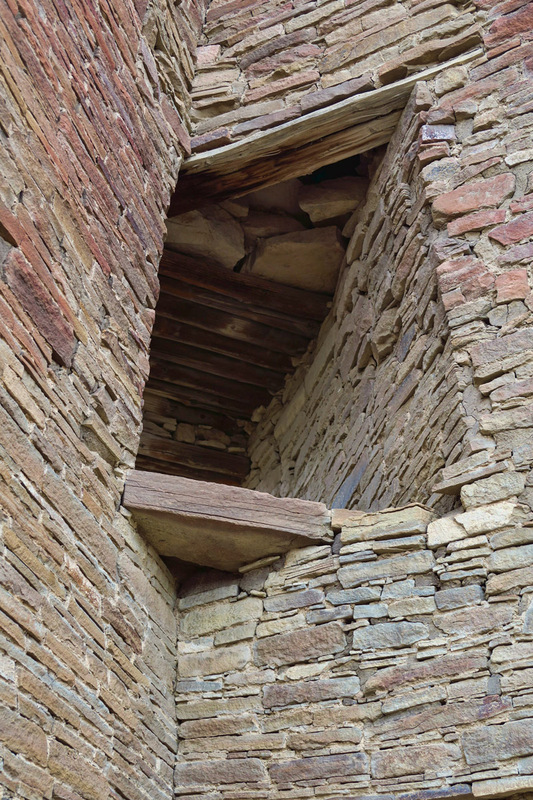 Its interesting about the pits in the houses because there have been excavations on Orkney at Skara Brae http://www.orkneyjar.com/history/skarabrae/ and they discovered similar pits which were thought to be early saunas, with the water heated by hot stones. Its so interesting visiting these places. What a wonderful experience for you and thanks for sharing. I doubt I’ll ever make it over there with my tow car, a Fiat 500. Not enough clearance. Since your RV and mine are much the same, I like to see where you take it and where you won’t take it. Tell me, since you’ve had it winterized, I’m assuming you carry drinking water and use public showers but how do you flush the toilet? Thanks! Hi, Betty — Thanks for the question. I just keep a large gallon jug of water in the shower stall, and pour in about the same amount as would be added during a normal flush. My tour through lower Colorado had me stopping at several hot springs, which helped with showers, but I also had a personal “first,” to shower in one of those TA Travel Stops. It was cleaner than some hotels I’ve stayed in! They even provide shampoo, towels, and a hair dryer. For me, the worst inconvenience was washing dishes, but then I just used a large pot and heated water on the stove. Only the rinsing was a pain. I keep a 5 gallon collapsible Coleman water jug in the rig, so I used that for washing dishes. Thanks Suzanne. Always glad to get good information on ‘boon docking’. So, I had my black tank valve freeze on my first time out. My camp host thawed it out with a hairdryer. So you don’t worry about water freezing in your black and gray tanks? Mine have heaters but I didn’t turn them on the first night so maybe that’s why it froze. I would love to see Chaco. 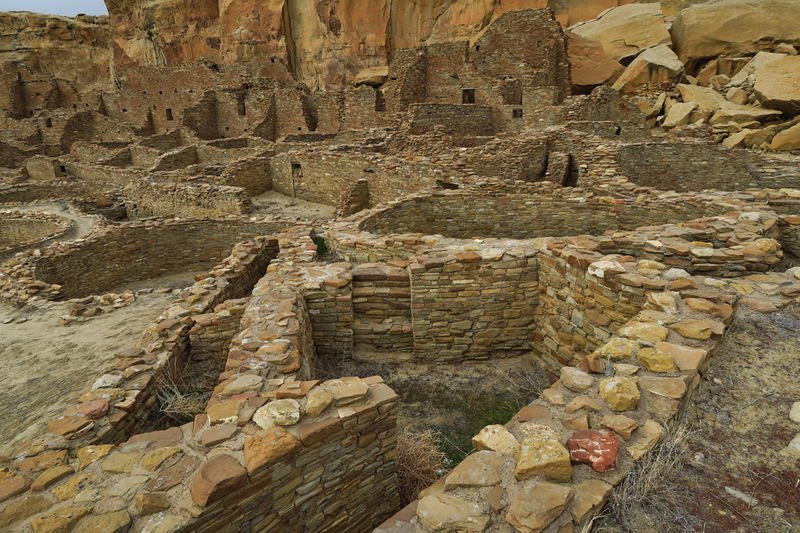 Have visited Mesa Verde. It’s amazing how they let you just walk around loose in those places. 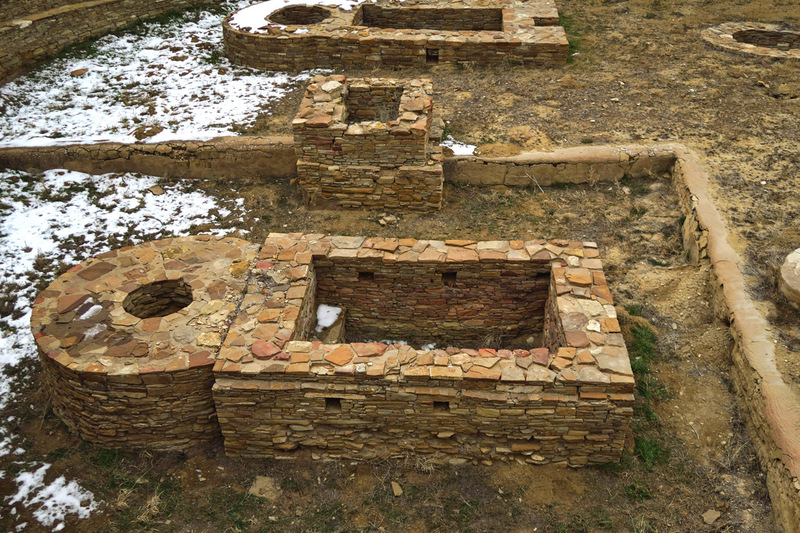 Have you been to Las Vegas, NM hot springs. Very primitive old abandoned resort. 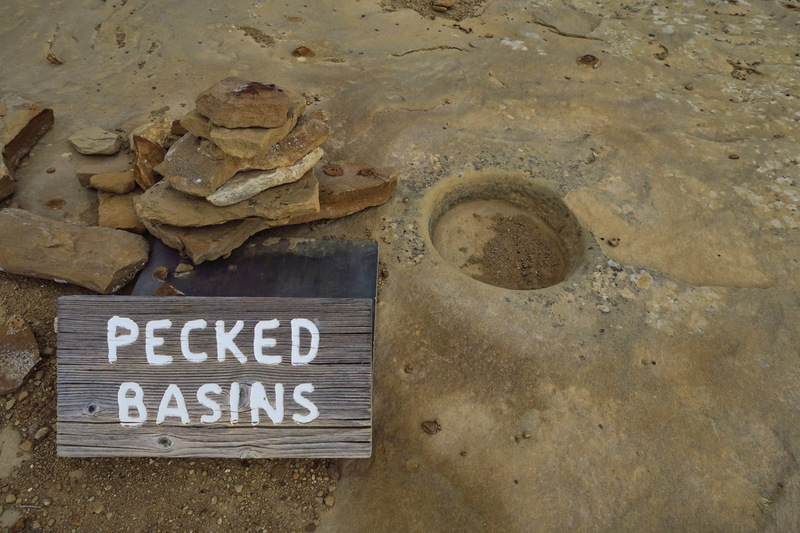 What other hot springs did you go to? Pagosa? I did go to Pagosa on my way back to TX. LOVE that place! But I have never been to LV, NM. I will check that one out. Thanks! I kinda think that road is a good thing, as you said, keeps all but the most dedicated folks out of there. We actually parked the MoHo in that wide parking area at the beginning of the 21 miles section. Wouldn’t have left her there overnight, but it did keep the tracker miles to a minimum. And, we too, received blessed sunshine for our visit, but it was of course in March…I think…Geez, thank goodness for the blog to help me remember. We came in from the other side, longer dirt road in better shape. We had a tent not only the ruins are impressive the night sky was amazing. Hi, Jeff — I’m curious…when you say “the other side,” do you mean from the South near Cuba, NM? I was told the “other” road was even worse than this one, but it sounds like you may have found a better way? I believe you came down from the north west on NM57 from Nageezi, we came up from the SW from Crownpoint,NM on NM57 – It’s about 30 miles of much better dirt road, but also has cattle guards that may high-center a lower clearance RV like our Views. Do a test drive before bringing the RV in. Very glad we spent a couple nights there. I had no idea about Chaco. The road looks like the moon in places. I am heart sick about leasing land out there for drilling. Oh, what a wonderful post. 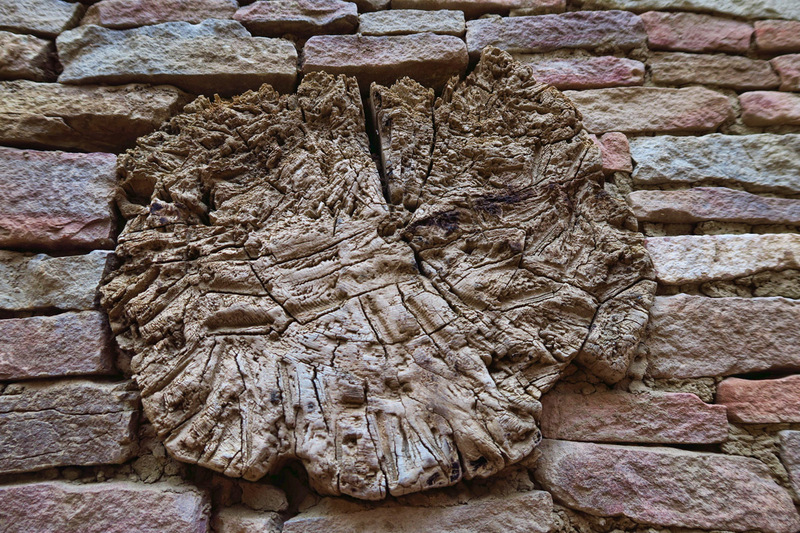 Chaco has been a target of mine for a long time, and your picture really show what to expect. I had heard the road was “bad” but your pictures added specificity!! I love your photography. 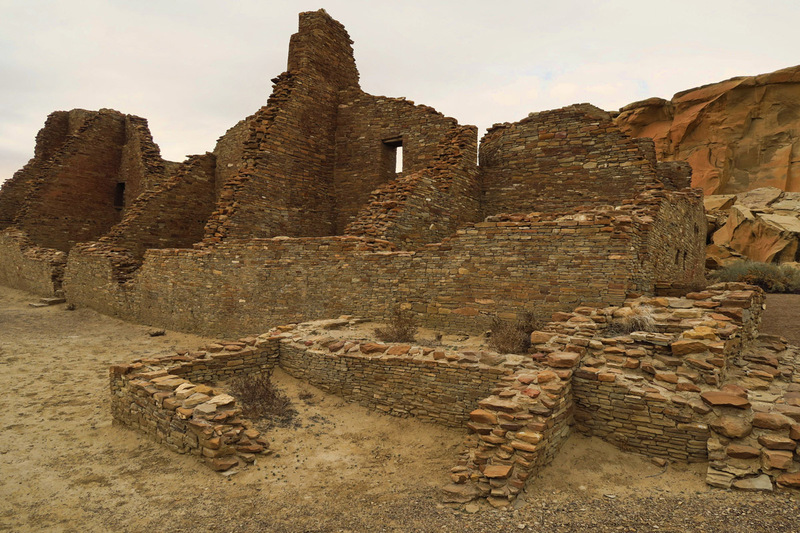 We are planning to visit Chaco, and various other lesser known ruins in that area in mid March/April. We’ll just have to tough out the road because I am seeing this place!! 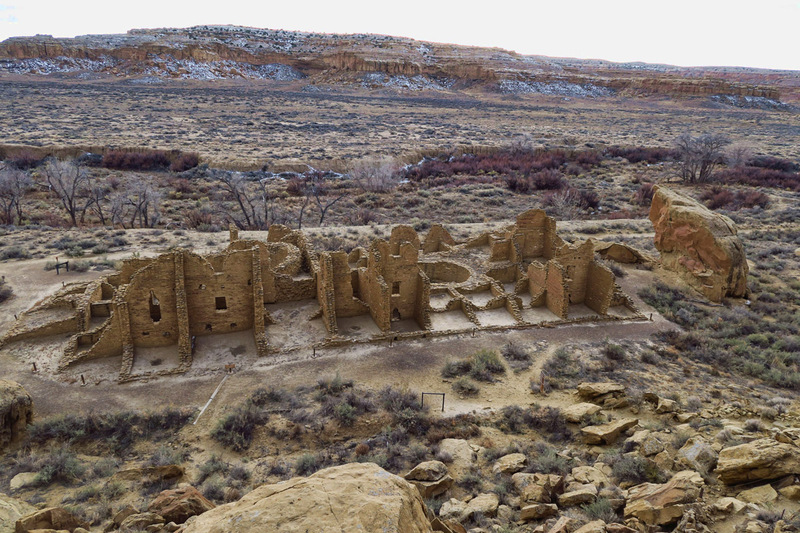 I’ve been reading two different authors on the ancients in the southwest and both have covered Chaco. It looks and sounds amazing. I can’t wait to see it in person. Thanks for the great post and awesome photos and tips:) I still can’t believe that is road. Guess we’ll drive the ditch, as well! GORGEOUS PHOTOS!!!!! I’d never heard of that place and I live in NM!!! Chaco has been on my list forever, yet have heard horror stories about “the road” so haven’t made it yet. So many sites to visit and so little time. There was talk years ago about paving the road but NPS didn’t really support it either. I hate that BLM has leased this surrounding land. Another “road” comment: 4 years back we traversed from the Nageezi Trading Post (550) with our Navion/View (before toad). We sustained 1 cracked egg. The 5 days of exploring and hiking was spectacular & well worth the hour of <10 MPH corduroy washboard. (Conversely, flying over the bumps at 35+ MPH seems to work well for some of the more experienced locals!). Our exit south on the 57 to Seven Lakes was longer but on a "somewhat" better road. If you don't return Suzanne, here are a few pieces of "media" that offer additional insight to a truly magical place. 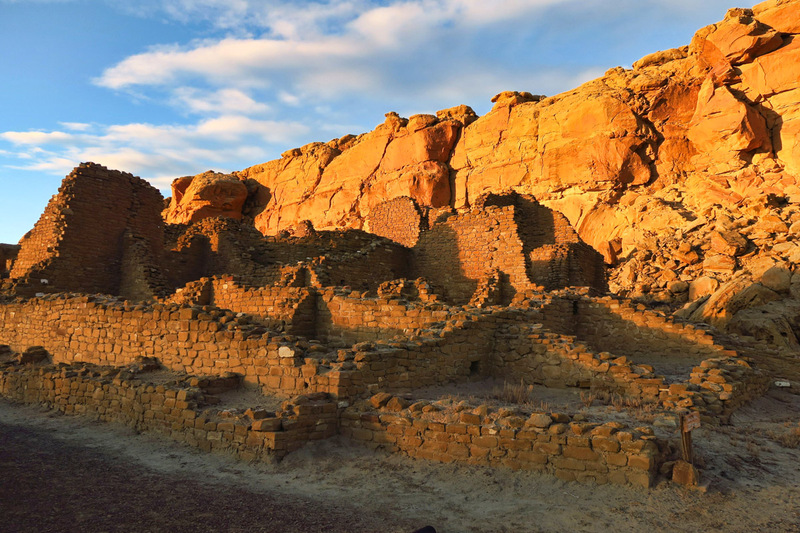 A Hillerman read with Chaco connection: "A Thief of Time". Based on this posting we left the camper behind in Farmington and car camped for one night. Evidently though the road has been significantly improved and was just a bit “washboardy”. Nothing that our camper couldn’t have handled. We took 550 south to 7900 and then onto 7950. Maybe 12 miles of dirt road in total and nothing that any car or camper couldn’t handle. A fabulous trip all in all!